For most people, having a full and healthy-looking head of hair symbolizes youth, attractiveness and allure both personally and professionally. As such, it is important to know what kinds of effects a hair restoration procedure can have on your daily life and interactions. One main goal of Hair Restoration is that it should be unnoticeable to all but those you tell. Did you know that about 50 million men and 30 million women suffer from male/female pattern baldness or have thinning hair? Though various treatments are available, many potential patients shy-away from the traditional “strip method” for hair replacement because they may not be good candidates for it, or due to the slow recovery period. Others may not prefer the loss of feeling at the incision site, the tiny linear scar that appears on the back of the head, or the amount of post-operative discomfort involved. After careful research, Dr. Patt of the Houston Center for Facial Plastic Surgery has chosen to provide the Follicular Unit Extraction (FUE) treatment method utilizing the NeoGraft® Automated Hair Transplantation system. The FUE hair transplantation technique removes individual hair follicles from your scalp in their naturally occurring groupings of about 1-4 hairs, and then places them in areas of the scalp where balding has occurred. 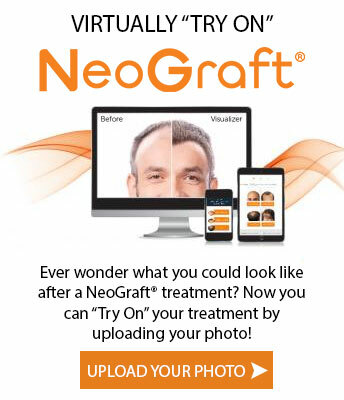 The NeoGraft® system is the initial and only FDA cleared follicular unit harvesting and implantation system. It delivers automation of the FUE technique, and is the most advanced technique in the hair transplant and restoration industry. This innovative system uses pneumatic controls to precisely extract complete individual hair follicles which can be instantly transplanted to the preferred areas of the scalp. The NeoGraft® automated system is the only complete harvesting system on the market, and has the only ‘NO TOUCH’ implantation technology currently available. Hair Restoration with NeoGraft® technology offers absolute exact harvesting and placement, delivering repeatable results. With this technology, each follicle is removed individually while the patient remains comfortable. A natural looking head of hair is created with this minimally-invasive procedure. Hair loss can be a very emotional part of the natural aging process for some people, and seeking ways to curb, or slow, this particular process used to be difficult. NeoGraft®’s innovative technology provides a distinct solution to hair loss, allowing patients to achieve natural looking results with no linear scarring, and minimal downtime for recovery. Hair restoration with the NeoGraft® procedure is unnoticeable, making it strictly your secret to tell. Superior Results – More natural looking hair, that provides style flexibility for both men and women. Affordable – Payment options are available to meet your needs. The NeoGraft® Automated FUE procedure is also helpful for fixing visible linear scars from previous “strip” surgeries; and to ‘fill in’ or camouflage those old scars by transplanting new follicles along those areas.